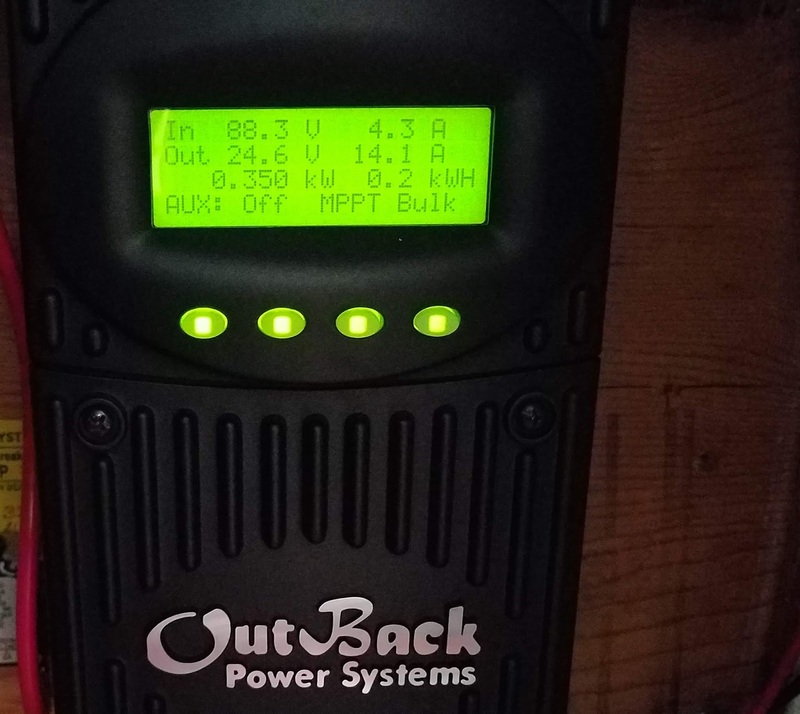 With just 24 volts, this small solar panel controller made our lives normal when all else, except Wilmington city water pressure and natural gas availability failed. The electricity was conditioned and regulated in this black box from a panel of photovoltaic modules atop the boat that had weathered the storm. Our batteries were charged daily for AC, microwave, water, fridge and cook top, under a cloudy sky. Wonderful. Our hearts go out to fellow neighbors who have died, been hurt and or displaced by hurricane Florence. We have witnessed first hand the devastation of such storms since a few years prior to Hazel in 1954. Wrightsville Beach and Wilmington, NC have been hit many times but folks never fail to pull together. Looks can be deceiving. These three boats are really not smiling. All took a real beating and managed to stay afloat. the amount of damage sustained. How can one be prepared when the terror is that the season and seasons to come are not over? That answer for us has begun to take shape but is not fully developed. However, there are some very important events through which we have endured with Florence that point toward a unique solution, the MOG which we named ALGEMAC II. A true Net Zero machine (subject of our next blog). 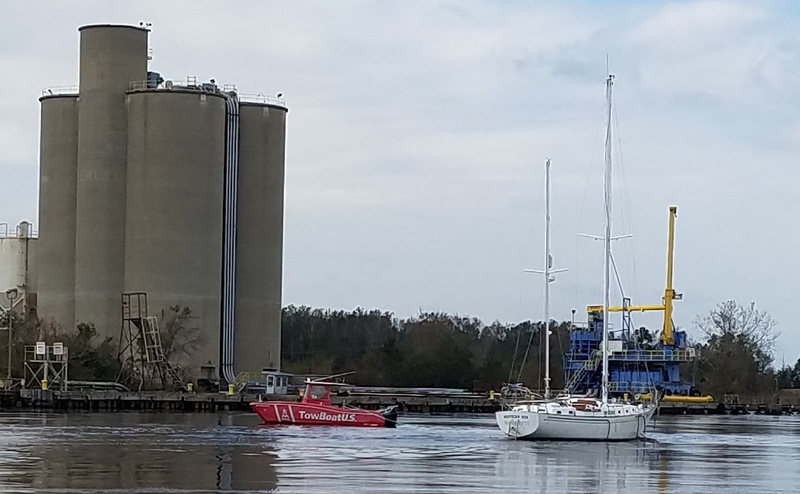 All three boats sustained damage from a 40 foot sailboat that broke from her dock at another marina and entered our fairway. 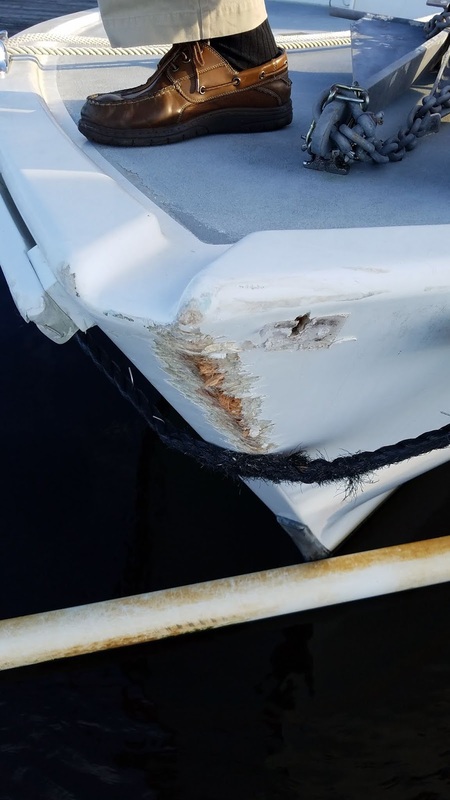 Our bow was raked, the next neighbor's bow was completely hacked through and the sailboat next to him had its stanchions, toe rails and hull raked. The erant sailboat then exited to ramble over the waterfront. To be so fortunate as to have three places locally to stay during the hurricane and following days, was God sent. Unique to that is the ability to compare each of the places as to robustness, safety, security, power, conveniences and food availability. The options are as follows 1. 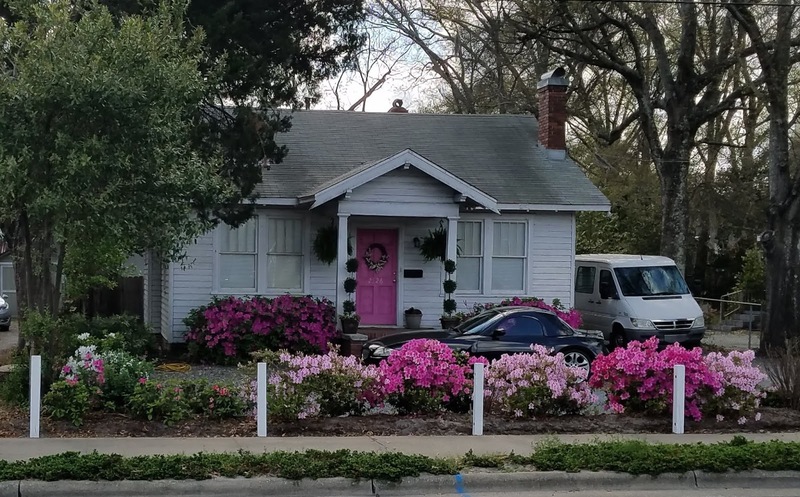 A 1935 2 bedroom 1 bath Craftsman style house just 2 miles outside center city Wilmington, 2. 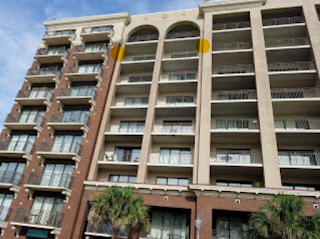 An eighth story 2 bed 2 bath modern condo, centered downtown on the waterfront of the Cape Fear River, 3. 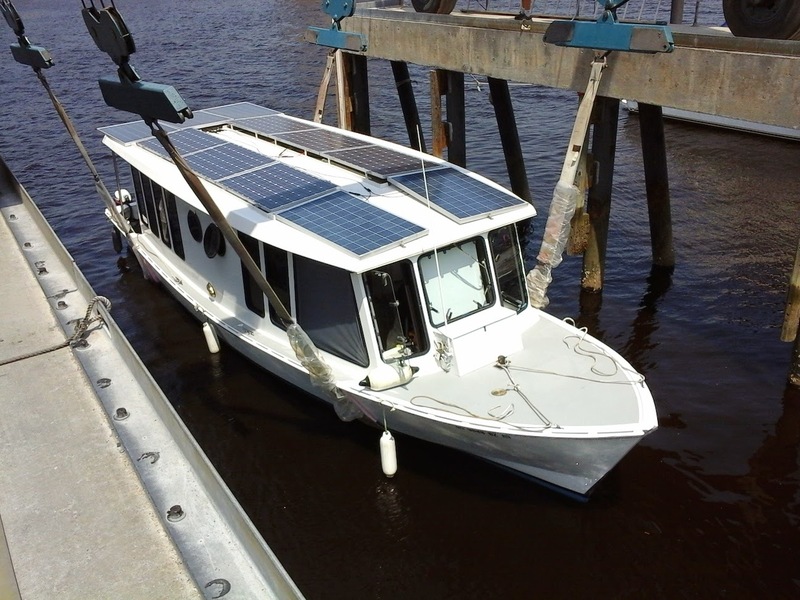 A 40 foot Totally Electric Powered Solar boat at Cape Fear Marina on the Cape Fear River in her wind & wave swept berth. The distance spanned is just three miles. Boat to condo 1 mile and condo to house 2 miles. 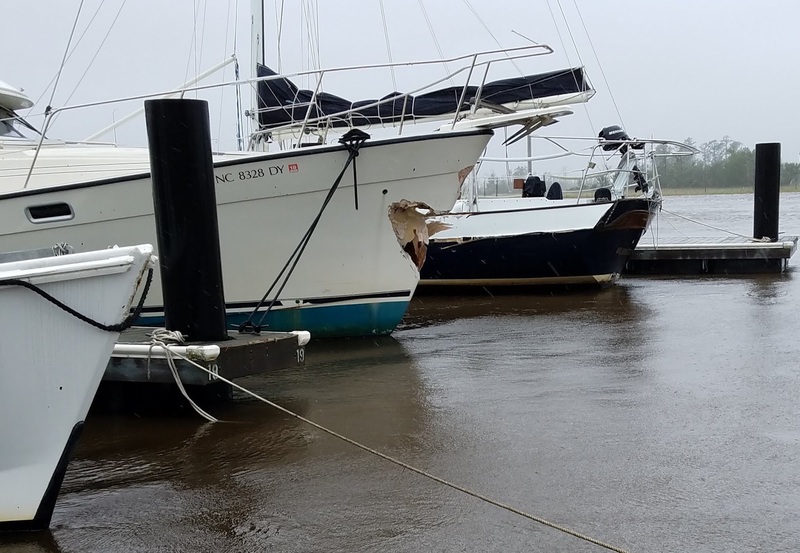 during the storm while the boat was in the water at Cape Fear Marina. fared very well with no leaks at all. of all the places to stay, with lights, TV, AC, fridge, etc. rain at over 80 miles per hour. An initial summation is that over the ten day period of approach to departure of Florence, we lived in all three places. Each will be discussed for its reasons that attracted us. The bottom line is that although we were inconvenienced, we suffered no harm. Some of the structures did but no drastic rework will be needed. 1. 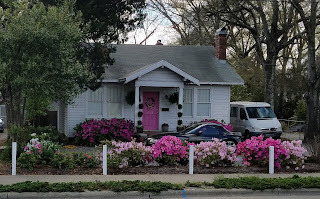 The 1935 house has been through Hazel and storms prior and after. It is well built with yellow pine 'real' 2x4 dimension lumber and a bird mouthed roof clad with t&g pine boards. It rests on a two foot high brick base with brick piers beneath the hard pine doubled floors. The water and natural gas worked throughout the storm for the watertight house. The only drawback was the lack of air conditioning and the critical need to empty the fridge of all food. The fridge was emptied and cleaned immediately after the hurricane winds stopped. Sandwiches were made and milk transferred across town to the boat whose fridge functioned tirelessly from the solar electricity. We left the house having one night with the storm and one additional night before it got too warm and humid without AC. 2. 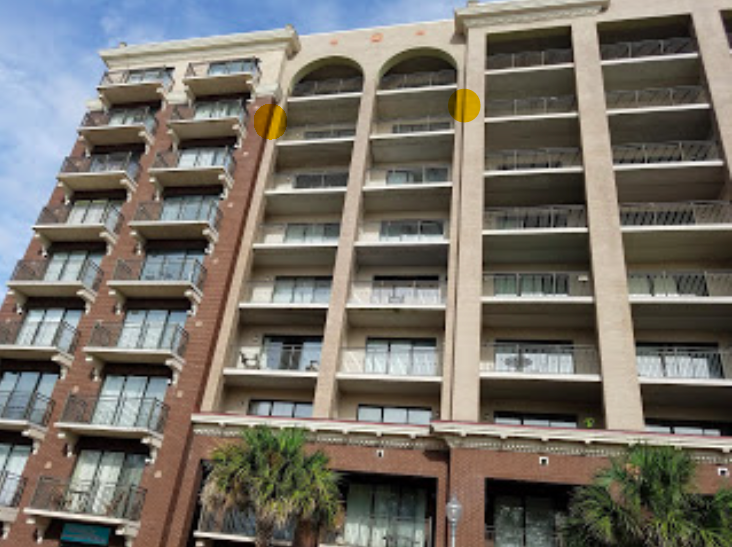 The condo was visited but had no AC or appliances functioning. 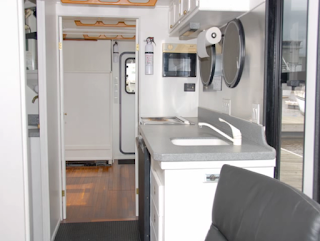 As it is up for sale, we did not want to risk habitation without the AC and appliances powered. So we skipped #2 for a later revisit. 3. After checking on the condo and seeing all was well, we proceeded to the boat. All the sandwich makings, milk, cereal, bread and sodas were put aboard when the sun had popped out. Temperature inside was about 100 degrees F. After packing the fridge and stowing food, we mounted one of the two AC units and went for a two hour drive while the AC cooled down the aft salon. That night and several more nights were cool enough to put a cover on the bed. In minutes the AC unit of only 5 thousand BTU is installed in any of the 'slide down' windows just like the window opened next to the AC unit. Plug it in to the inverted 24 volts DC to 120 volt house voltage and it starts to cool. 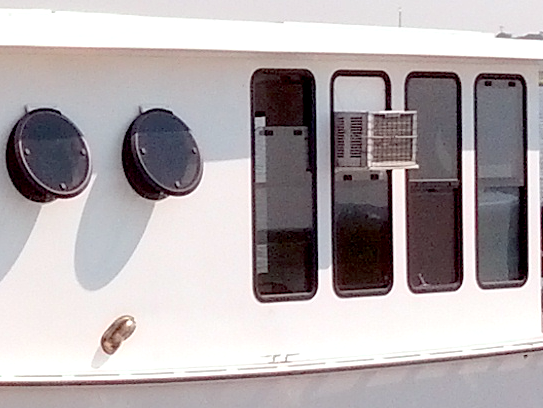 Just one of these units in the salon and saloon will keep the boat cool. The more sun beating down, the more electricity available to cool the boat. Absolutely counter intuitive. Pretty cool, huh? In the case of this hurricane the boat's unlimited range was redirected, having all the solar electric power to afford us a most comfortable stay without issuing noise and deadly carbon monoxide from a generator running in a slip (illegal in quite a few marinas I might add). Only the six main modules were kept for the hurricane. Five of the eleven were removed to our van for safe keeping during the event. 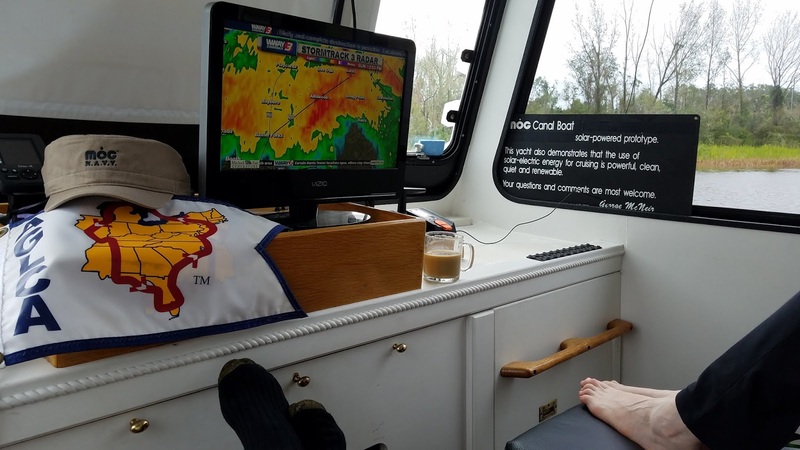 Rains returned day after day as we sat aboard and watched local TV using an antenna that picks up 21 broadcast stations in the local counties. There was plenty of news, weather and commentary with good entertainment both old and contemporary. The AC stayed on while we made coffee in the microwave, cooked food, washed up and were able to perform all the tasks of living at home with only our Sun replenishing the large 21kwh battery storage. Please note the morning cup of java next to the TV. Florence's gusts, rain and clouds cannot stop the morning cup of coffee and the latest TV broadcast (no cable availability). So we put our feet up, mug next to the TV, AC cranking out the cool air while drinking in the view. An exceptional boat. There was no electric, phone, cable or internet service at the docks because of storm damage. Our sinks and shower and commode worked as they would at home. In fact with all the misery being caught by many, we two old folks counted our blessings. We were able to comfort loved ones with a few texts gotten during a short drive through a few cell hotspots. The marine radio gave us contact with the USCG and others if needed and was of additional comfort. After several great nights on the boat, we moved to the condo when its power returned. Having spent two nights at the condo we returned to the little 1935 house getting things ready for the return of its power. No power, it was a let down followed by another night at the condo with dinners out at KFC, Waffle House, Hardees and The CookOut (the only places open and with very limited fare). fend off tide driven debris strikes. Looking at the whole ordeal, it was more like a hate/love vacation. 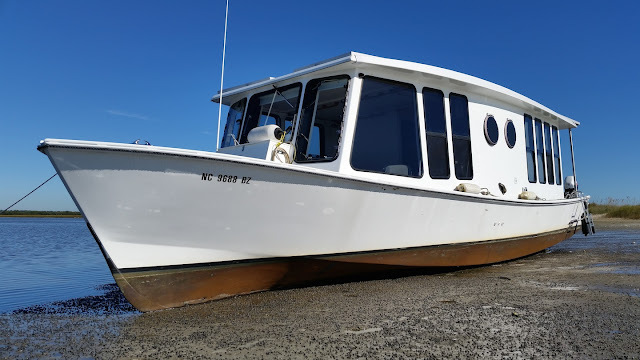 The cost of the MOG boat was no greater than a 32 foot Island Gypsy back in 1994. In return we have had nearly 30 years of uninterrupted free solar power. She is not fast and not heavy ocean going but has made it through 7 named hurricanes on her own hull in the water, this being the first in an actual slip. All the other 'canes have been on the hook in Pages Creek estuary Wilmington, NC. in the up position, there is room to move around besides the saloon. Please do not think we are ignorant of being blessed. Of all the places we stayed we can definitely say that the Totally Electric Powered Solar (TEPS) boat was the most unique and unexpectedly satisfying of all. place themselves in even greater peril. The concept of the MOG was a sailboat speed trawler type boat for two people with no range limitation. Efficiency prohibited using any conventional craft because the roof's solar electric collection area was the key design element. The design was a clean sheet monohull that included an extreme shallow draft of 18 inches for a forty foot boat with electric drive motors. Everything is custom. People often ask how much do we save on fuel? Our answer is actually "the fuel came with the boat" and a 25 year warranty on the solar electric modules atop the boat. 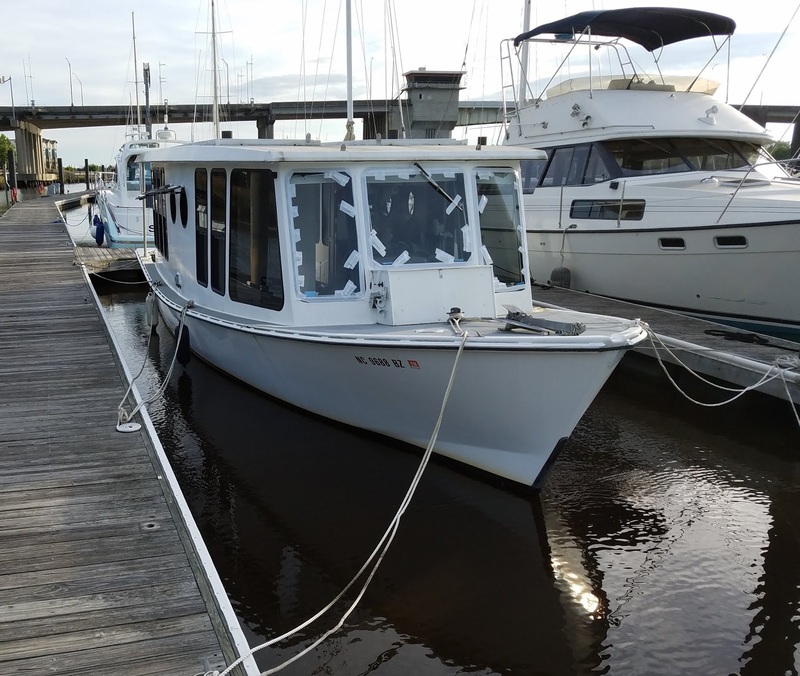 In effect, we do not save anything, it is just that other boaters pay more to travel with powering payments for maintenance, repairs, oil, filters and fuel requirements never ending for them. Our downside might be speed but we are retired and time is not as precious as the ability to loiter in deep or knee deep waters. Yep, purposely aground with the ocean over the dune. 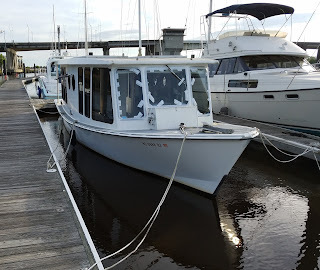 After the ALGEMAC II (MOG) gets her nose (bow) fixed, placed back in the pond and electric motors remounted, we will continue in the Carolinas to put more miles beneath her hull to fulfill our continuation of the Great Loop adventure. What a beginning year for us that this has been!